As part of its ongoing and apparently unstoppable effort to transform its roster of famous cartoon characters into their more-marketable flesh-and-blood equivalents, Disney recently announced that it was planning a live-action movie about 101 Dalmatians villain Cruella De Vil. (The task of converting Maleficent into a sympathetic anti-hero having apparently just been a warm-up for investing audience interest in a woman whose primary hobby is the premeditated murder of puppies.) 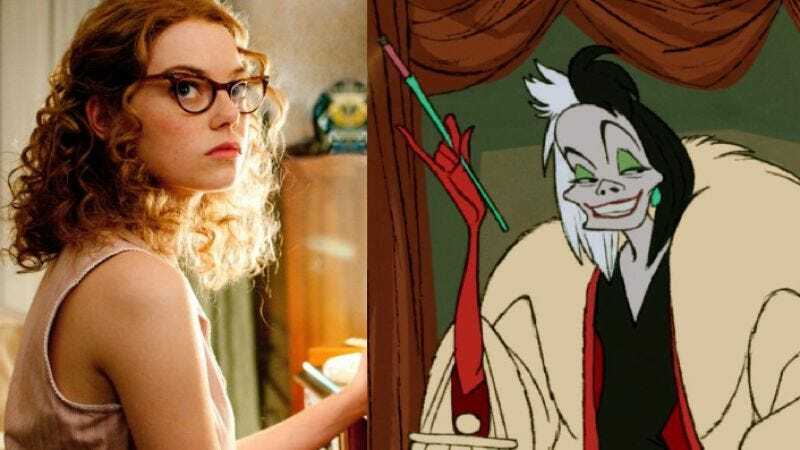 Now, The Hollywood Reporter’s Heat Vision blog is reporting that Emma Stone might be the actress tapped to step into Cruella’s fashionable dog-skin coat and Halloween fright wig, with the Amazing Spider-Man actress in early talk to take on the role. The film—written by 50 Shades Of Grey’s Kelly Marcel and currently lacking a director—is being pitched as an origin story for the character, presumably explaining why she has a monomania for murdering dogs, when there are so many more socially acceptable animals to de-pelt just toiling away on farms around the country. (Our guess? Early trauma from a misapplied Rorschach test and a sound track tape of ferociously barking dogs.) In any case, Stone—whose last film was Aloha, and who’s expected to appear in Whiplash director Damien Chazelle’s new musical, La La Land—is presumably just happy to be taking on a role she won’t be yelled at for playing (except possibly by canon-minded Once Upon A Time fans, angry that she’ll be rehashing an origin story that show apparently already covered).